When we first started cutting back on our driving we didn’t talk about it much. When I got down to driving one day a week, we just let be what would be. This past month it’s been the center of conversation. Most everyone has been very supportive and encouraging. It has helped to know that I have many friends who live car-lite lives, whether they know it or not. I contacted a handful of these people about writing down their experiences, especially those related to living in the TriState region. I am very excited to post my first interviewee and her experience living with fewer cars than adults here in Huntington, WV. Could you please introduce yourself and your family? How many adults and how many vehicles? We are the Klover/Kittinger clan – parents – Raine Klover and Chris Kittinger and kids William (7) and Katie (5). We currently own two cars as we recently bought a used Toyota Corolla to replace our minivan. The minivan is for sale. Only Chris drives as I have never had a driver’s license. How long have you been car-lite in Huntington (and before living here)? How did you come to the decision to have fewer automobiles than adults? We have lived in Huntington just over a year. Prior to that we lived in Albuquerque, NM for six years. I have also lived carless in Dayton, New Orleans, Dallas, and Seattle prior to meeting Chris. I chose to not obtain my license while in high school (for no good reason) and after graduation moved to Seattle where a car seemed like more a hindrance than a help. Living in Seattle for nine years solidified my view that driving was not for me. Walking and public transportation made so much more sense in a large city where you had to pay extra to have a parking spot at your apartment, pay for a parking spot at work if you worked downtown, and paying meters everywhere else. Add in car payments, insurance, gas and maintenance and not having a car seemed the way to go. As I’ve moved around the country I’ve made sure to do as much research as possible to move to neighborhoods that are walkable, have good access to public transportation, and are easily accessible to my work situation. What’s your current transportation situation? Chris used to work in downtown Huntington but recently took a job in Charleston and commutes there Monday through Friday. We have decided to move from a minivan to a car in search of better gas mileage as Chris now has a long commute. I am a stay-at-home mom and I also have a dog nanny job and work in an administrative position with my church (I mostly work from home, but it does require some errands). I am a walker. I walk to my dog nanny job and also walk my kids to school and walk for most errands. I use the bus occasionally. What makes this work for your family? We were very intentional when finding a home in Huntington. As soon as we decided to move to Huntington I hopped on the internet and looked up information on the Tri-State Transportation Authority and scanned Google and Bing maps to get the lay of the land. I quickly identified the South Side neighborhood as the one for us. A neighborhood school, walkable to downtown, a small local grocer, Ritter Park, and multiple bus routes running through it made it an easy choice. What have the challenges been? Does anything change with the seasons? As I have lived as a non-driver my entire adult life and have moved around the country I’m pretty good at identifying areas that will work with my lifestyle. We have not had many extra challenges in Huntington. Bus service could definitely be improved, I have had to use cabs a few times to places busses just don’t go or weren’t convenient within the timeframe I needed them. The Huntington downtown core and South Side neighborhood are extremely walkable. I can walk to church, school, doctors, library, shopping, restaurants and Ritter Park. Moving from New Mexico, weather has been an issue for us – we’ve had to buy raincoats, umbrellas, and boots! What have been the responses of your peers/colleagues been when they find out you live a car-lite life? I am definitely the oddball in my social circles. I also cook entirely vegan so I think most people just chalk up my idiosyncrasies to being a hippie chick from Seattle. Many people have had a hard time believing I’ve chosen to live this way and actually enjoy it. For me being carless or car-lite has never been a burden – owning a car seemed like more of a burden. Were there any unforeseen benefits to living with the decision to have one car? Or if you foresaw them all, what have been those benefits? There are so many benefits to living a car-free or car-lite life. We spend less money on transportation than just about everyone we know. Our car is paid for, we only have to pay insurance for one driver, and our driving errands are grouped together which help saves on gas. The health benefits are great – I walk on average 4 miles a day during the week. There is no need to go to the gym to run on a treadmill when you walk that much. Our kids have walked/bussed since they were babies. One bonus of being car-lite is more time with our kids. Walking the kids to school is a treat for both the kids and me. We don’t spend a lot of time running to multiple acitivities and that allows them to focus on the things they’re really interested in. Swimming at the Y, acting camp at the Renaissance Center, cub scouts at First United Methodist all are within easy walking distance. One benefit of walking that most people probably wouldn’t think of is the community factor. Traveling in cars keeps us isolated from others. I’ve had so many great conversations on the bus and sidewalk and made friends with other regular commuters when I bussed to work in Seattle and Dallas. How could Huntington, as a government or it’s citizens, improve or change to make your situation more beneficial, safer, convenient, etc.? What resources or advocacy would you like to see? Huntington definitely needs some infrastructure improvements. Sidewalks, or lack thereof, really need a lot of improving.Bus service that is more often and with more extended service hours would be great. As far as advocacy I believe more “walking tours” of different neighborhoods would be a great way to show people that Huntington is walkable, and that there are so many things things you miss in a car that you notice when walking. I think P.A.T.H. is a great thing for Huntington as are the monthly Critical Mass rides. 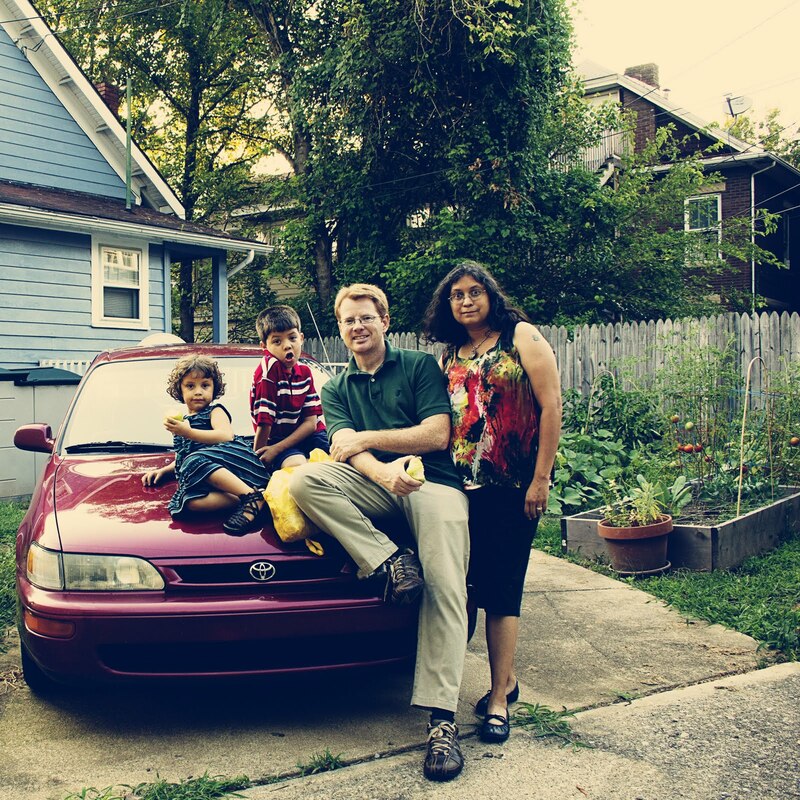 Do you have any advice for other families similar to your own who may want to reduce the automobiles in their lives? Do your research! Take a critical eye to all of the places you currently go by car. Are there similar options that are closer to home? Simple things like changing your grocery store, bank, or dentist can make going car-lite seem much more manageable. Is their a busline a few blocks from you that you never even noticed. Do you have coworkers or neighbors you can carpool with? And just try it. Pretend one of your cars is dead for a week and see how you get by just using one. If you’re really adventurous try using none. I occasionally toy with the idea of learning drive and getting a car. Usually after conversations with “car” people. If I had a car would I go more places? Probably. Is that a good thing? Probably not. All of our needs are being met, and we have a very full life. Adding another car would add more expense but not improve our quality of life. I think we’re good to go as is. Thank you Raine for taking the extra time to highlight Huntington, your family and your choice to live a car-lite lifestyle. Of course I would love to read it! There will also be more of these. I have a couple lined up and I am looking for others, if you can think of anyone in the area. Just a quick update, we sold the minivan and are now back to being a one car family. We will use the money from the sale of the minivan to do some projects around the house that we have been wanting to get to. And by downsizing we also save money. A win/win. Chris, Thank you for the update. I am especially happy you were able to sell the van!